It takes up to $480 per month on average for one national missionary to be fully supported through GFA World. By giving $40 per month to GFA’s National Missionary Program, you would be partnering with these missionaries and impacting Asia together with them. 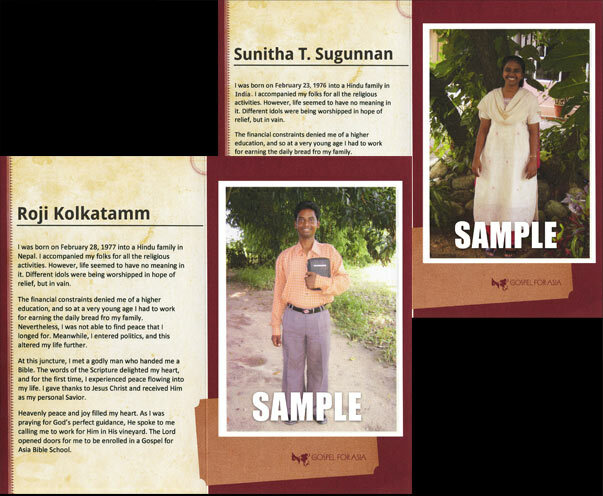 For every $40 monthly commitment you make, you will receive a photo and the personal information of a missionary you can pray for. As a sponsor of national missions, you are asked to pray regularly for your missionary. Your prayers are vital for the success of their work on the field. You will receive updates that will keep you informed about the region your missionary is serving in. These regional updates will show you the ministries taking place and how lives are being touched and villages are being transformed. Can I write to my national missionary? Because of security reasons and the enormous overhead it would create, we are unable to allow direct correspondence with your national missionaries. Many may have little or no knowledge of English, and GFA does not have sufficient staff to translate thousands of personal letters. Most importantly, direct communication could severely hinder their work among the non-Christian communities and place their lives in danger. How will I receive news from my missionary? It is our sincere desire to keep you updated on what is happening on the field. You will receive regional updates from the region that your missionary is serving in. Also, we publish a weekly email digest that includes stories and videos from the field. You can view all the regions we work in here. If you would like to receive our weekly email digest, please sign-up here. Can I send my missionary a special gift? In the spirit of unity and equality, we have a policy that does not allow for special gifts to be sent directly to a missionary. The leaders where your missionary serves make sure all the national workers have the resources they need to live and serve in their particular area of ministry. Your support of national missions helps make that possible. What does my $40 pledge provide? While it takes up to $480 to fully support one national worker, your $40 pledge is one part of the program that helps provide for our brothers’ and sisters’ ministry needs as well as living and family expenses. Your prayers will make a significant difference in your missionary’s life. It’s through your prayers that your missionary will see breakthroughs in his or her ministry; it’s through your prayers that people in the areas where he or she serves will come to realize the love of Christ; it’s through your prayers that your missionary will be sustained and able to press on when hardships arise. We'll be glad to assist you. Call us at 0800 819 819.